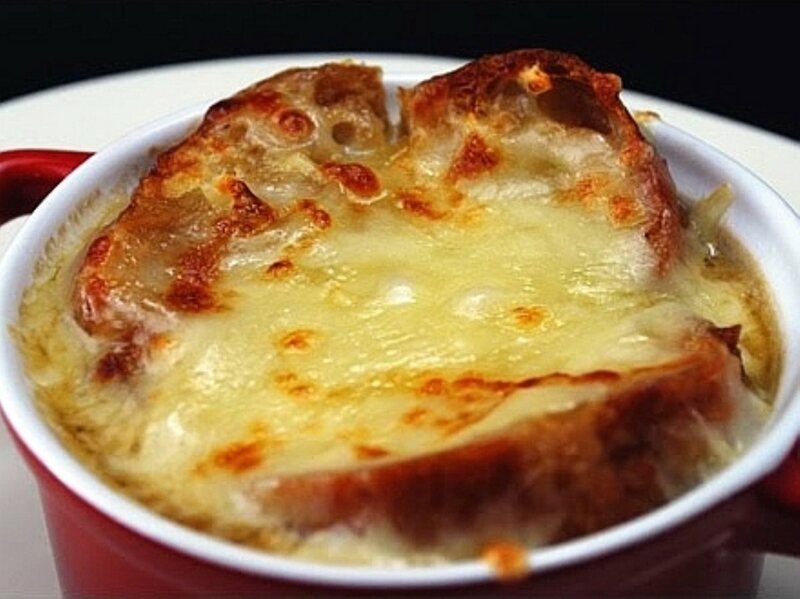 French Onion Soup is ideal for an autumn or winter night. Traditional French Onion Soup uses beef broth, but, since my wife doesn't eat red meat, I usually make it with chicken and vegetable stock. Slice onions 1/8 inch thick. In a large stockpot, melt butter over low heat. Place onions in it and cook slowly for 1 1/2 hours. Add stock and bay leaves and simmer for 1 hour. Slice baguette bread in 1/2" slices. Put in toaster, to a medium brown. Turn on broiler. Spoon soup into oven-safe serving dish, top with toast and equal mixture of the grated Emmenthaler and Gruyere. Place under broiler, broil 3-6" away from heat for approximately 3-5 minutes. (Watch it carefully -- you want a nice browning but not burning. ).